Cabo San Lucas was the location of my first Counselors Academy Spring Conference. During my brief tenure, I’ve had a chance to meet a number of top-notch professionals. People who have taught me so much, making me realize I have so much to learn! Putting together this year’s program, with a strong co-chair and an engaged executive committee, I wanted to share a few quick inside tips on how you can get the most out of this year’s event in Key West. It is easy to sit on the sidelines and listen to some great speakers, gleaning insight that is relevant to where your practice is headed. But that is like being at the Super Bowl and watching the event’s inline at the concession stand. This year’s event has a number of great opportunities for you to get involved. The Counselors 101 event is a great way to meet other first time attendees and to connect with seasoned attendees who know the ropes. Take the momentum of your first session and soak in the fun at the opening night reception. The breakfast roundtable and dine around events are a great place for informal networking. Also, if you have a question for one of the speakers, ask away. Chances are someone else has the same question. If not, they are all very approachable to talk to after the session or at other points of the conference. As a father of two great and confident daughters I know I am getting into dangerous turf by even hinting I have “favorite” sessions. Well they are all great sessions! However, there are some of the sessions that I am looking forward to seeing how you respond.. They include: the “Bold Moves” session where we will hear from PR firm owners about a bold move they implemented that worked well for their firm; key note speakers Stan Phelps, Shonali Burke and Steve McKee; and the “Focus” sessions, a new approach that will feature TEDx style presentations from our presenters. Enjoy Key West. There will be plenty of time to knock out emails during your flight and after the session. Get here early or stay later to enjoy an extra day. The hotel is a great place to relax. They have an hourly shuttle to the center of activity where you can hangout at Mallory Square, shop, rent a boat or take a selfie at the southernmost point in the United States. But you can’t do any of these things unless you register. There are airline discounts and free shuttles from the airport to the Marriott. Just visit this link. One of the biggest benefits to attending and participating is returning to your team at home! Sharing the contacts you’ve made, lessons you’ve learned and ideas that your office can apply is invaluable. Hope to see you in sunny Key West! Click on these links for more information about Tom and his firm The Garrity Group Public Relations. One year during Balloon Fiesta, I think it was 1998, I wanted to have a way to show the color of the Fiesta to the national and international media after the balloons had landed. We had developed this elaborate backdrop from an old balloon envelope, draped it from the top of the tent to the back of the stage. Since there was so much extra fabric, we covered parts of the stage for effect. It was the first year we had regular press briefings at the event; we’d talk about the number of balloons launched, have guest speakers, things of that nature. Well the person I had just introduced to the microphone was bigger than me and I remember the person was taking a more middle of the road approach to the podium instead of yielding so I could sneak by. I decided to make a wider than usual exit. But, because the balloon envelope was draped across the back of the stage it was impossible to figure out where the stage ended and air began. I took one step, then two, making contact with the stage. The third step was nothing but air. The next thing I remember was being cocooned in a balloon envelope, in this nook between the stage and the back of the tent and hearing a collective “gasp” from the 30-40 media in attendance. All of that to say, I tend to avoid stages, elaborate backdrops and memorable exits. 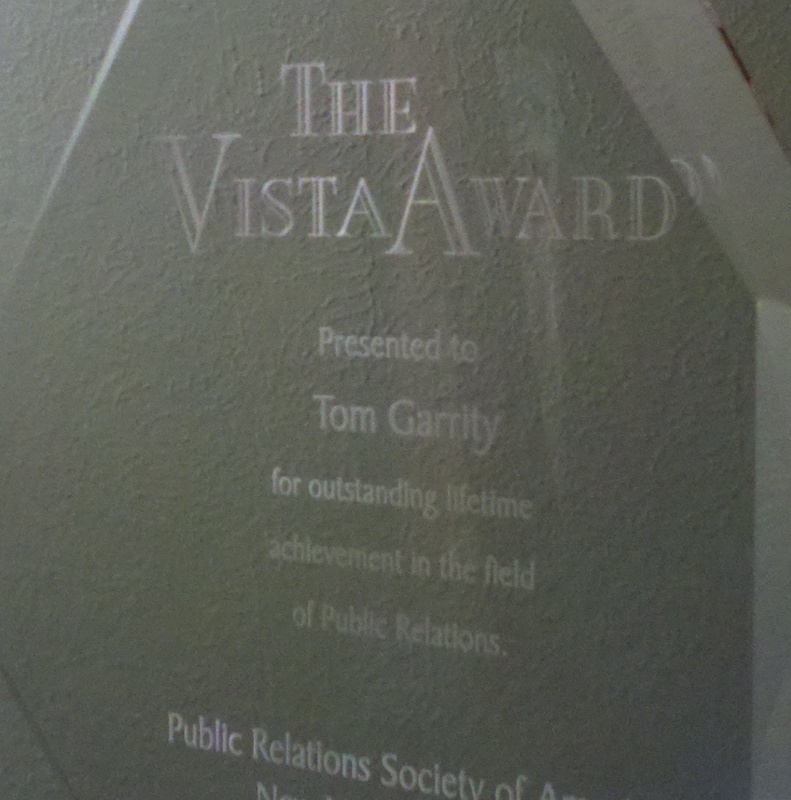 Thank you to the New Mexico Public Relations Society of America for the Vista Award. While my interactions with Lee and Marie Hirst were limited, I am truly humbled to be included in a recognition that includes New Mexico’s first family of public relations and so many other practitioners whom I’ve called upon in the past. I respect them more than they will ever know. One thing Lee loved to do was run. It is a passion which I’ve successfully avoided for 46 years. Completing two marathons and two half marathons over an eight month period, recently provided some insight as to why Lee loved it. It helps to clear the mind and prioritize. It also helps to provide a great metaphor for what we do, collectively, for our clients. We help them to run in such a way as to win, to finish the race. There are many different ways and speeds which you can run. Like running, campaigns run their course, events end and a marathon is always 26.2 miles. We do what we do because it is our passion. For me, it is a great privilege to help people when they are in that hole, in the midst of a crisis. The families of Ana Marie Regino Martinez, Matt Propp, Joe Vigil, Dr. Daniel Ronel; organizations that include the Balloon Fiesta, Furrs Supermarket, Calvary Chapel, First Community Bank and the Kirtland Partnership Committee through two BRAC hearings; as well as a host of other people and organizations I can’t mention that allowed me to provide insight when they were in the midst of their waterloo. The biggest threats to our industry are best fought with transparency, ethics and integrity. The enemy is found in complacency and relevancy. Sometimes relevancy just looks at us straight in the face. Such was the case as a cub reporter in Billings, Montana. My assignment, cover a revival being led by the Reverend Billy Graham. I went and covered the event and came back to edit my story. When finalizing the sound bite to use, I called in the evening anchor, a salty newsie who was also a member of the John Birch Society. I played for him the sound bite of John 3:16 “That God so Loved the World that he sent his only Son, that whoever believes in Him shall not perish but have eternal life.” The anchor took a drag from his cigarette and asked, “that’s it? !” I said, yeah. That is a message as relevant today as it was more than two thousand years ago. As long as we are relevant, we are part of the discussion and have a seat at the table. Thank you to the current members of The Garrity Group Public Relations for enjoying Jimmy Buffet songs and making our office a fun place to work. I covet your perspective and professionalism. Also, thank you to our Garrity Group alumni, your continued contributions to the profession provide motivation as I continue to celebrate your successes. Finally tonight, it is a gift to have my wife Jackie and our two daughters Emily and Casey here… thank you for not changing the locks on the front door! My mom is here and my dad, while in Houston is here in spirit. I am also blessed to have extended family and friends in the audience tonight. Thank you for this honor and good night.